The GMI BM 25 packs the benefits of a fixed system area monitor into a rugged, user-friendly and transportable instrument. 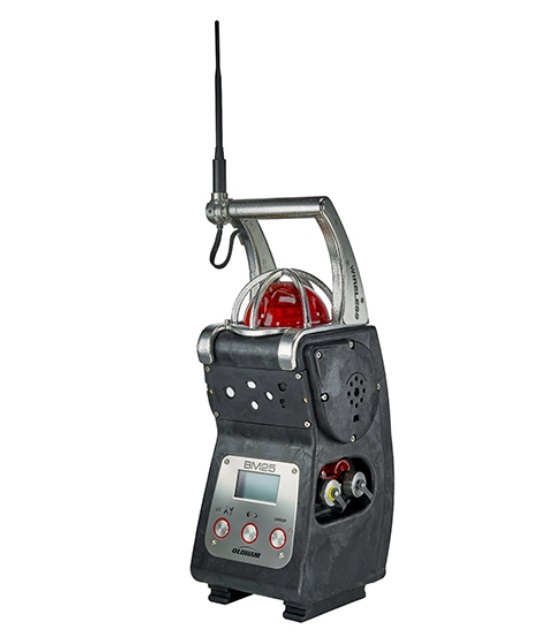 It was designed to detect one to five gases for mobile or temporary work applications, team protection, area surveillance or places where fixed detection systems are not suitable. Powered by a NiMH battery pack, the BM 25 offers up to 170 hours of continuous run time. Other standard features include STEL and TWA values, as well as a datalogging capacity of more than four months. Multiple units can be grouped using optional alarm transfer kits. This protects larger areas by transferring alarms from one BM 25 to the next. An intrinsically safe trickle charger is also available for long-term area monitoring in classified zones. The BM 25 is durable and versatile. It is suitable for a wide range of industries including refineries and pharmaceutical production. Applications include turnaround work sites, rig overhauls and fence-line surveillance. * The Dual BM 25 Intrinsically Safe Trickle charger which includes an additional IS power module, is required to. 6314092	BM 25 IR Sensor, 0-100% vol.